Amid a seemingly never-ending debate about what the spirit of cricket actually means, the one thing that is undeniable is that cricket can be a force for good and a vehicle that can be used to raise awareness of issues that might otherwise garner little or no publicity. In that regard the period 2015-16 saw the ICC use its profile and the profile of its events to publicise significant subject matter that affects people way beyond the boundaries of a cricket ground. Cricket For Good was created as the ICC’s global community outreach programme aimed at leveraging the vast power and reach of cricket to positively impact the lives of children and families worldwide. Cricket For Good announced a five-year Corporate Social Responsibility (CSR) partnership with the United Nations International Children’s Emergency Fund (UNICEF) in October 2015 and that partnership will be used as the ICC’s platform to advocate for children in India and other countries where cricket is a popular sport. At a global level, Cricket For Good in partnership with UNICEF will collaborate in specific areas of nutrition and child development, water and sanitation hygiene, quality education, empowering adolescents, child protection and child health, all aimed at improving children’s lives. So, as ICC enters a new cycle of events, we stay steadfast in our commitment to the Spirit of Cricket and making Cricket ‘The World’s Favourite Sport’. The CSR programme will build on the past success to engage more effectively with cricket fans expressly the young generation. In response, we have created an umbrella marque for the ICC Corporate Social Responsibility (CSR) programme under the name “Cricket For Good”. It will be ICC’s global community outreach initiative that will address a range of social issues and support initiatives that will strive to positively impact children and families worldwide. 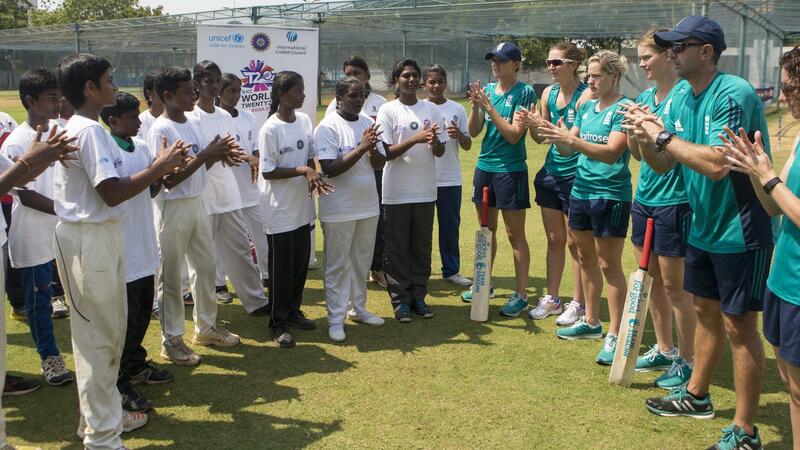 Cricket For Good will forge strong partnerships with internationally recognised community organisations to create positive social change through the game of Cricket. At a global level, Cricket For Good in partnership with UNICEF will collaborate in specific areas of Nutrition and Child Development, Water and Sanitation Hygiene, Quality Education, Empowering Adolescents, Child Protection and Child Health to improve children’s lives and transform the future. While the global partnership between ICC and UNICEF will have a great impact during ICC Events, ICC and UNICEF believe it can expand to include activities which will further empower young children outside of the tournaments. During ICC Events, Cricket For Good will work with a locally recognised community organisation and ICC Commercial partners in a joint effort to support activities that enhance the world of children.